Why Buy Our Garden Awnings? At SunSpaces, we know that every customer has different needs for their garden. 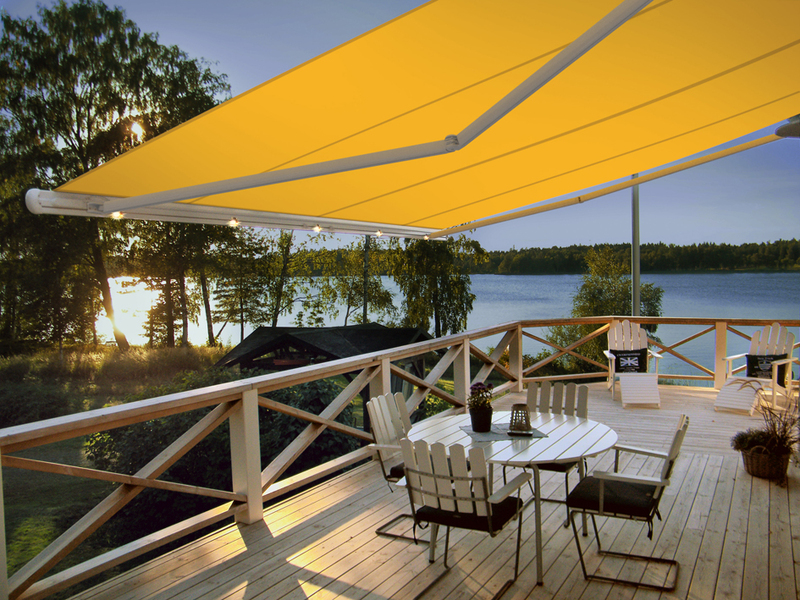 So, we do our best to provide the perfect awning for every type of outdoor space. We offer a wide range of retractable garden awnings so you are guaranteed to find the ideal shelter to suit your outdoor space needs. 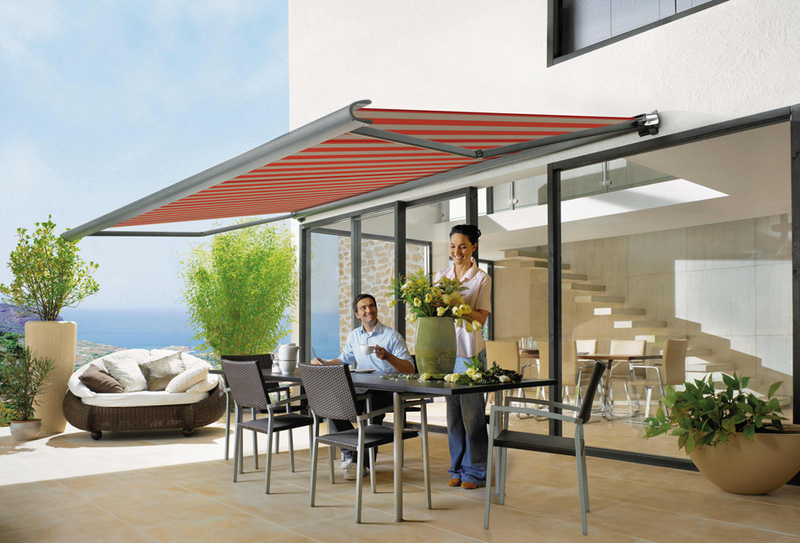 Our retractable awnings allow you to enjoy a perfect day in your garden. At a push of a button, you can enjoy the shade when you most need it or easily retract it to enjoy the sunshine. Forget the awnings of yesteryear with manual pulleys for opening and closing, our advanced awnings incorporate features such as automatic sensors, outdoor heaters, LED lights and electronic remote controls. Therefore, your awning can be perfectly tailored to your taste and you can enjoy heat and lighting as and when you require it. Our Compact awning is an entirely retractable awning that is controlled using an electronic remote. When not in use, you retract it quickly and quietly - perfect for every outdoor living space! The awning frames are available in several different sizes with bespoke colours available upon request. They also incorporate integrated gutter systems and water outlets which prevents water from building up on rainy days. Our Compact Awnings are also wind resistant, so you can be sure they won't flutter or break even on the windiest days. Compact Awnings are made of durable materials and come with an incredible 5-year warranty. Our Lite Awnings have LED lights that can be dimmed during sunny days and adjusted to suit the mood when the sun goes down. You can create a customized look for your outdoor space by selecting the colour and pattern of the fabric, and the size that suits you. Our Lite garden awnings are electronically retractable using a remote control or through an intelligent motor system that responds to weather changes. The motor can be controlled using an app installed on your phone, making this awning one of the most versatile that we offer! Our Elite Garden Awnings are available in a wide range of sizes and colours. They are wind resistant hence very durable. It comes with a 5-year guarantee thus gives you value for your money. We have utilised the latest garden awning technology to ensure that our Elite Awnings are perfect for your outdoor space. They are made from a UV-resistant fabric that offers protection from direct sunlight. They're also available in a wide range of fabric colour and you can customise your awning by including a heater or lights. Therefore, depending on your specific needs, we can provide the Elite garden awning that will meet your specifications. If you have any questions about the different kinds of Awnings that we have to offer, don't hesitate to contact us by calling 0800 085 8110 or send us an email at info@sunspaces.co.uk. Sheryl Crow had the right idea back in 2002 when she told the world she was going to “Soak Up the Sun”. We took that statement to heart and you can too – all from the comfort of your own home – with a gorgeous veranda courtesy of SunSpaces! While Britain is notorious for its wet weather and grey skies, it’s not unusual for us Brits to receive a heatwave from time to time. In fact, according to the Met Office, 2018 saw the UK achieve the joint hottest summer on record and the hottest ever summer for England in particular. The hottest day of the year saw the UK hit a peak temperature of 35.3 degrees – just a few degrees shy of the UK’s hottest temp ever of 38.5 from 2003! Whether you believe in climate change or not, there’s no denying that the weather in the UK can be pretty unpredictable. From a random spot of springtime heat to a blistering belated “Indian summer”, the UK weather loves to keep us on our toes. To make things even more unpredictable, these sunny spells can occur seemingly out of nowhere and a bout of “beer garden weather” can arrive without so much as a precursory red sky at night as a heads up. With such an erratic climate, a sweltering Saturday can be a true surprise gift from the gods. Don’t be caught napping – be prepared for those impromptu summer nights with a handy veranda from SunSpaces. Okay, first things first, why get a veranda? 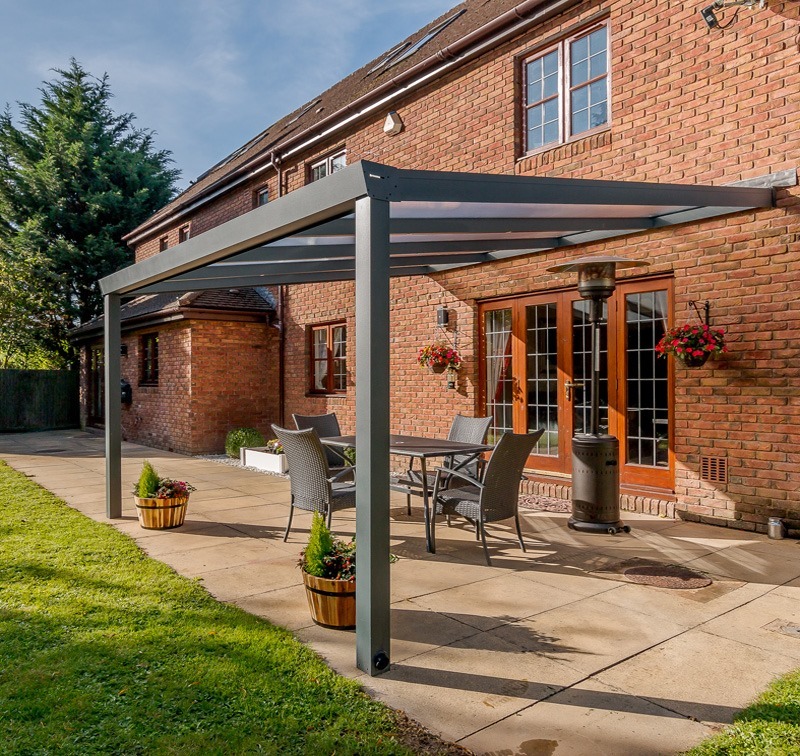 Quite literally bridging the gap between your house and garden, a veranda is a structural cover that shelters the area immediately outside your home’s interior. For most back gardens, this is typically a patio or section of decking. A veranda can turn this open space into a sheltered terrace that essentially acts as another room to your house, providing ample protection from the elements while still allowing you to enjoy the benefits of being outdoors. 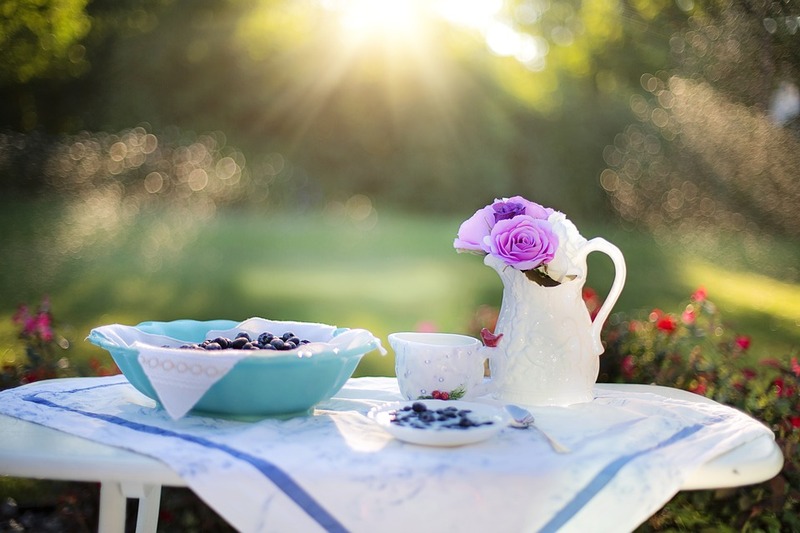 If breakfast in the sun is your cup of tea, a veranda can provide. Meanwhile, a veranda can also make for the ultimate compliment to a backyard barbeque, creating the perfect setting to enjoy your outside space all evening long. Next up, do you need planning permission to get a veranda? While not always the case, there is a chance you may need to get planning permission before you upgrade your home with a veranda. To avoid causing yourself summertime sadness, it’s wise to play it safe. Take the “mission” out of “planning permission” by contacting your local planning department for advice specific to your property. If a permanent fixture isn’t quite your cup of tea, you’re not out of options just yet. Why not consider a more temporary solution? Extendable and compact, our range of drop-down awnings offer all the shady benefits of a veranda with the advantage of also being retractable, allowing you to enjoy your outdoor space without permanently adjusting the look of your property. Simply unveil this canopy when the mood strikes and retract at your leisure when you see fit. Slender yet sturdy, these extendable canvas shelters make for the perfect happy medium if you’re considering a veranda but don’t want to go all-in. So, there you have it. Enjoy your outdoor living space year-round with our wide range of outdoor fixtures. What are you waiting for? Transform your property today with SunSpaces! For many office workers, most days are spent sitting in front of a computer monitor for several hours at a time. Even those not perched at a desk for eight hours a day can often find their evenings parked in front of a TV screen. On top of that, many of us are also guilty of spending downtime, bedtime and even meal-times peering into a phone screen, endlessly scrolling through Facebook feeds and Twitter timelines. After all, those cat videos and dog memes aren’t going to “like” themselves, right? Nevertheless, all that screen glare isn’t good for the eyes. Luckily, there’s a simple workaround for this and regular breaks can be a wise move. Better still, switching off completely can have untold health perks, particularly when that time is spent outside. Spending more time outdoors can have a whole host of health benefits, with the potential to heal mind, body and soul. These can range from improved vision to increased mental performance, all from simply stepping outside and escaping the confines of your living room or workplace. Now we’re not saying you need to spend your days wandering the Earth with nothing but a pop-up tent for nightly shelter, but a healthy dose of natural sunlight and fresh air can truly work wonders. Don’t believe us? Take a look at these surprising health boosts you can gain by stepping away from the screen and out the front door. While it’s true that being exposed to heavy sun for prolonged periods of time can make you feel tired and drowsy, soaking up natural daylight can be great for energy levels, particularly in the wintertime when days are shorter. According to NHS.uk, lack of sunlight causes your brain to produce melatonin which, in turn, can make you feel sleepy. Taking a break outside can not only help you feel energised in the day, but it can also give you a better night’s sleep later on when you do call it quits. Exposure to sunlight can also have a notable impact on your mental wellbeing while being cooped up indoors can have notable adverse effects. This particularly evident in the winter months when daylight hours are notably reduced. Many people in the UK experience Seasonal Affective Disorder (SAD) when the clocks go back, bringing summer to a cold, wintry halt. The shorter days and extended nights that accompany it can make for a depressing combination. Mental health charity, Mind, has found that being outside can help benefit your mood greatly and experiencing nature can profoundly affect your overall outlook. This has even been known to include mental health problems, such as anxiety and depression. Our increased daily reliance on computers, phones and tablets has meant a notable increase in myopia (or nearsightedness). Throw in a national love for TV and computer games in our spare time and it’s no wonder the UK’s eye-sight is taking a dip. The New York Times has previously reported a strong correlation between eye health and a person’s overall exposure to sunlight. These facts were the result of a sizeable study done by the London School of Hygiene and Tropical Medicine, King’s College London and several other respected institutions. According to the study, those who had gotten the most sun during their younger years were about 25% less likely to develop myopia by middle age. Exposure to sunlight up to the age of 30 proved to have a protective benefit, notably benefitting eyesight in later life. Your eyes aren’t the only things that can lose focus – lack of daylight can also cause your brain to lose focus as well. Exposure to natural environments can be just the boost you need if your mind is wandering and your attention is waning. According to AskTheScientists.com, breaking up the working day with time outdoors has been shown to enhance concentration and increase productivity. Meanwhile, creative problem solving and cognitive function has also been known to improve through outside activities, particularly when indulging in prolonged outdoor pursuits. Perhaps the most telling and important finding of all is that being outside has been shown to contribute greatly to overall bodily health – particularly due to its association with Vitamin D.
According to medical experts, humans are said to get as much as 90% of their Vitamin D intake from natural sunlight. Vitamin D can be a vital component in helping to maintain healthy bones and teeth, as well as contributing to cardiovascular health, including healthy blood pressure. Vitamin D has also been known to regulate insulin levels and can help aid and prevent diabetes, while it has also been found to strengthen the immune system. With such a profound list of great health benefits, is there any wonder they call Vitamin D “The Sunshine Vitamin”? So, we’ve heard all about the health benefits of being outside and worldly goodness that can be gained from being out and about – now what? Getting outside doesn’t mean you have to take up gardening or begin park running every morning. The outdoors can be a great place to simply relax and unwind and what better way to do that than in the comfort and privacy of your very own property? SunSpaces offer a wide range of garden rooms, verandas and awnings for a variety of properties, allowing you to enjoy the benefits of being outside without having to leave your home. Give us a call today on 029 2037 1575 or click below for more information. Alternatively, visit a showroom near you and get an in-depth look at outdoor living! Our Panorama SunSpaces with sliding glass doors are incredibly popular, especially at this time of year! They feature stylish 10mm thick sliding doors that allow you to feel completely submerged and in-touch with your garden. It is starting to get warmer but British weather can be very unpredictable. Our Panorama SunSpaces will keep you dry in unexpected rainstorms while still allowing you to enjoy the great outdoors. This SunSpace will help you make the most of your garden all year round! In this blog, we take a close look at a Panorama SunSpace that was installed for one of our clients. This client added a SunSpace and a raised deck to make the most of their outdoor space - and the results are breathtaking! The sleek Panorama Garden Room is a great match for contemporary outdoor furniture and the customer did a great job of giving their new deck a green finish with wonderful shrubs! Our panorama rooms are excellent for viewing your garden and surroundings, our client will be able to observe their whole garden from the comfort of their new Sunspace.